For once in my life, I actually won something in a giveaway!! I won Lynnderella Heart Star, a limited edition beauty filled with various black, white and teal glitters, along with some serious teal shimmer! 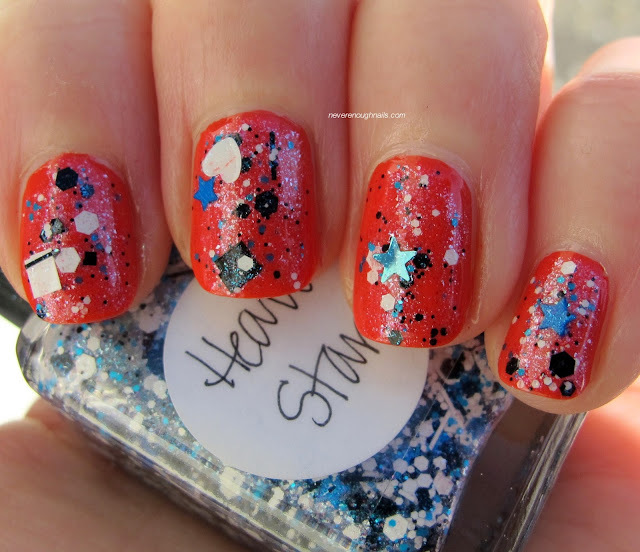 Heart Star has a bunch of different blue and teal stars, some holo and some not, and a TON of hearts in various colors. 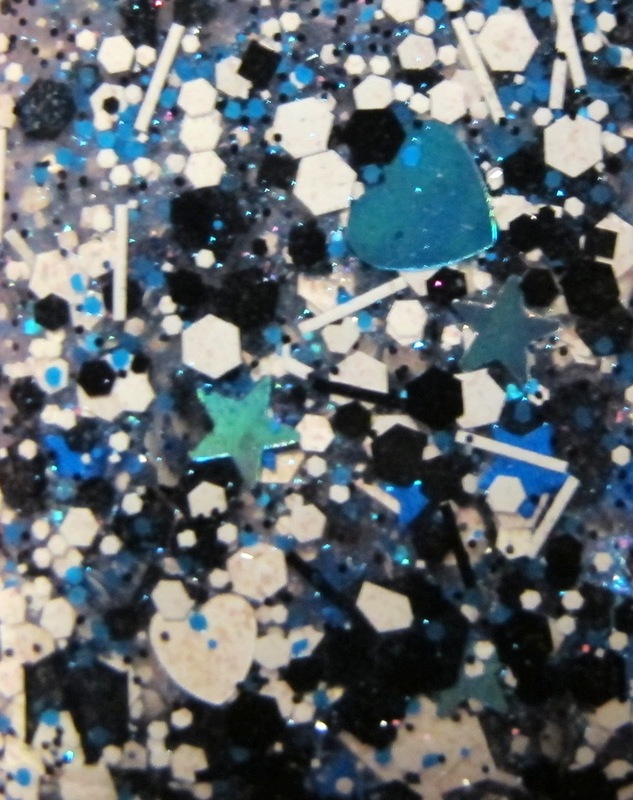 I saw black, white, blue, holo teal and giant holo blue hearts in the bottle. I definitely need to scrape the sides of the bottle before the next time I wear this though, because it did seem that the hearts and stars were getting stuck there. 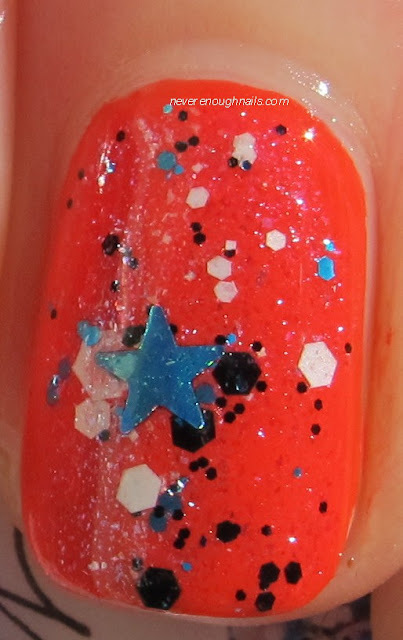 This is two coats of Heart Star over OPI My Paprika Is Hotter Than Yours. I did some re-arranging of the larger glitters after they were on my nails, for placement purposes. I would like to find more hearts next time, they look very plentiful in the bottle. The formula felt good, not too thick or thin, and it has a TON of shimmer in the base. I am SO thrilled to have won Heart Star! I never win anything, let alone an LE Lynnderella!! I can't wait to try this over a ton of other colors. Edit: Amanda of The Nail Polish Enthusiast wanted to see the elusive "giant heart" I referred to. So here is a pic! You can see that the blue heart is much larger than the regular sized white heart below it. The blue heart is also holo, although you can't tell that here. Lynnderella polishes are available at her eBay store. LE polishes are sold in an auction-style format, while all other polishes sell for $23. I might just faint from the awesomeness!!!! Congrats on winning such a fantastic prize! It looks great on you! So pretty! I'm intrigued what these giant hearts look like! Gonna tweet you! Amanda, I got your tweet and I am working on taking a giant heart pic for ya!